"These squares are my husband's favorite. We get some real, pure maple syrup from back home in Ontario, Canada, and they are just to die for. Hope you enjoy as much as we do." Combine the flour and 1/3 cup brown sugar in a mixer. Mix in the softened butter until a dough has formed. Press into an ungreased 8x8-inch baking dish, and prick with a fork. Bake the shortbread in the preheated oven until golden brown, about 20 minutes. 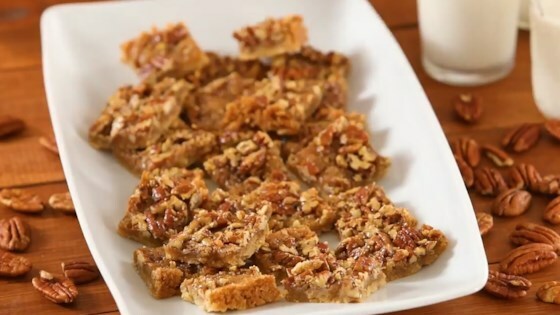 While the shortbread is baking, beat the egg in a mixing bowl along with 1/3 cup brown sugar, maple syrup, and pecans. Pour the pecan mixture over the hot crust, and return to the oven. Continue baking until firmed, 12 to 15 minutes. Remove from the oven, and immediately run a knife around the edges to prevent sticking. Cool completely, then cut into 1-inch squares to serve. The topping softened the shortbread too much and almost felt like it was uncooked. It was good, but I wouldn't use this recipe again. I would probably double the pecan. I doubled the recipe and used a 9x13 pan, and substituted an extra tablespoon of maple syrup for 1 1/2 tablespoons brown sugar. SO GOOD.